Maintaining your dental health is an important part of your overall health. Whether you are in need of cosmetic dentistry, such as Invisalign in Perth, or it has been a long time since you have had a regular dental check-up, Dentique Dental Spa is ready to meet your needs. You may be surprised to learn about the research statistics indicating the link between poor overall health and neglected oral health. Did you know that oral hygiene is very important for people with type 2 diabetes? A new study highlighted the importance of oral hygiene for people with type 2 diabetes, after finding that those with the condition may have better blood glucose levels if they look after their teeth. There is also more evidence of link between severe gum disease and cancer risk. A new study adds to accumulating research that gum disease is associated with some cancer risk. It reports a 24 percent increase in the risk of cancer among participants with severe gum disease. The highest risk was observed in cases of lung cancer, followed by colorectal cancer. You can have a read of the full articles on our Facebook page. In order to make sure you and your family are on track for great overall health, let’s go over some oral health tips. These tips are important for maintaining proper oral health habits that will support your overall health for a lifetime. 1. Remember to brush your teeth at least twice a day. No matter how young or old you are, your teeth need to be properly brushed more than once each day and preferably after each meal. Even though you may have busy mornings or be in the habit of eating on the run, the minutes you spend brushing your teeth as needed, will be well worth the investment in your optimal dental health. Using the right kind of toothbrush with the right brushing techniques will make the difference when it comes to removing plaque that causes tooth decay and gum disease from your teeth. Take your time and brush at least 2 minutes rather than being in a hurry to get it done. Making the time to invest in brushing and rinsing properly will be a great investment into your overall dental health. To find out how to correctly brush your teeth please check out this blog article. 2. Flossing each day is also an essential component to dental health. Floss helps remove the plaque between the teeth that cannot be removed by brushing alone. If you do not remove the plaque in those hard to reach places on a regular basis then you run the risk of build-up that becomes tartar. Tartar is something that weakens the enamel on your tooth, compromising the integrity of the tooth and threatening your dental health. 3. Eating healthy foods. avoiding sugar and drinking plenty of water also make a huge difference when it comes to taking care of your teeth..
We all know sugar feeds the bacteria in our mouth that increases the plaque levels. You can prevent tooth decay, tooth erosion and gum and bone disease by limiting the sugary foods and avoiding too much citrus. Eating well and following a good oral hygiene regime will help you avoid these dental diseases as well as halitosis. Chronic bad breath or halitosis has been shown to be a critical sign of poor dental health. Choose to drink water rather than sugary juices or sodas at meal times. Smoking is another factor that affects your health and quitting such a habit will definitely help in taking care of your teeth and preventing many dental diseases. Drink tea and coffee without sugar and remember that these beverages and tobacco can also stain your teeth. 4. Last, but not least, make it a priority to visit the dentist on a regular basis. Regular dental visits are essential for the maintenance of healthy teeth and gums. Checking your teeth for tooth decay is just one part of a thorough dental examination. 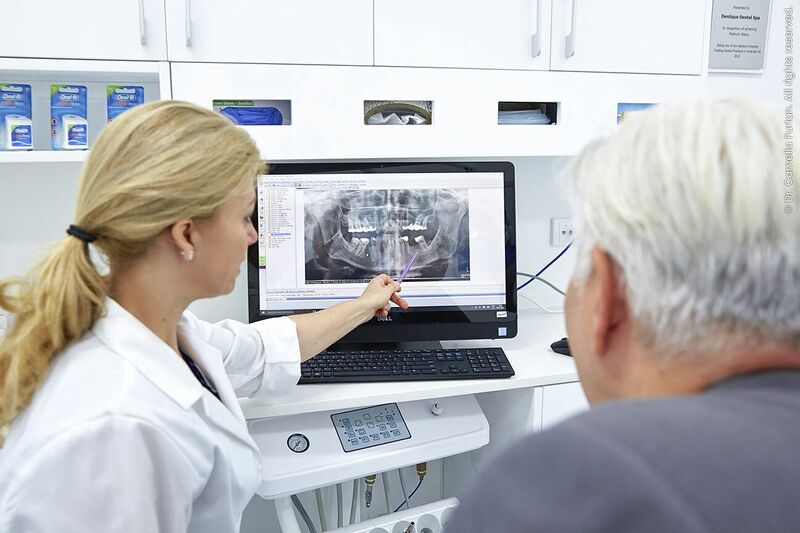 During your checkup appointment, your dentist (or dental hygienist) will likely evaluate the health of your gums, perform a head and neck examination (to look for anything out of the ordinary) and examine your mouth for any indications of oral cancer, diabetes or vitamin deficiencies. Don’t be surprised if your dentist also examines your face, bite, saliva and movement of your lower jaw joints (TMJs). Your dentist or dental hygienist will clean your teeth by removing the plaque and tartar that cause disease and stress the importance of you maintaining good oral hygiene at home between visits. It’s important that you see your dentist at least every six months. If you live in the area and are interested in learning more about general dental or cosmetic procedures or Invisalign in Perth, or if you have any simple or serious dental health concerns, at Dentique Dental Spa we are here to help you with all your dental needs. Come in and see us for a consultation and see the difference it can make to be looked after by a dentist who cares about your dental health.